Land art, variously known as Earth art, environmental art, and Earthworks, is an art movement that emerged in the 1960s and 1970s, largely associated with Great Britain and the United States, but which included examples from many countries. 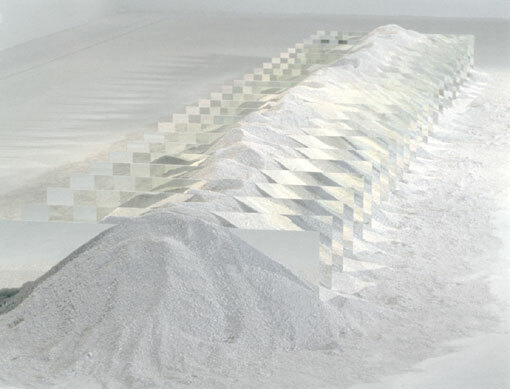 As a trend "Land art" expanded boundaries of art by the materials used and the siting of the works. The materials used were often the materials of the Earth including for instance the soil and rocks and vegetation and water found on-site, and the siting of the works were often distant from population centers. Though sometimes fairly inaccessible, photo documentation was commonly brought back to the urban art gallery. Concerns of the art movement centered around rejection of commercialization of art-making and enthusiasm with an emergent ecological movement. The art movement coincided with the popularity of the rejection of urban living and its counterpart, an enthusiasm for that which is rural. Included in these inclinations were spiritual yearnings concerning the planet Earth as home to mankind. In the 1960s and 1970s land art protested "ruthless commercialization" of art in America. During this period, exponents of land art rejected the museum or gallery as the setting of artistic activity and developed monumental landscape projects which were beyond the reach of traditional transportable sculpture and the commercial art market, although photographic documentation was often presented in normal gallery spaces. Land art was inspired by minimal art and conceptual art but also by modern movements such as De Stijl, Cubism, minimalism and the work of Constantin Brâncuși and Joseph Beuys. Many of the artists associated with land art had been involved with minimal art and conceptual art. Isamu Noguchi's 1941 design for Contoured Playground in New York is sometimes interpreted as an important early piece of land art even though the artist himself never called his work "land art" but simply "sculpture". His influence on contemporary land art, landscape architecture and environmental sculpture is evident in many works today. Alan Sonfist used an alternative approach to working with nature and culture by bringing historical nature and sustainable art back into New York City. His most inspirational work is Time Landscape, an indigenous forest he planted in New York City. He also created several other Time Landscapes around the world such as Circles of Time in Florence Italy documenting the historical usage of the land, and recently at the deCordova Sculpture Park and Museum outside Boston. According to critic Barbara Rose, writing in Artforum in 1969, he had become disillusioned with the commodification and insularity of gallery bound art. In 1967, the art critic Grace Glueck writing in the New York Times declared the first earthwork was done by Douglas Leichter and Richard Saba at the Skowhegan School of Painting and Sculpture. The sudden appearance of land art in 1968 can be located as a response by a generation of artists mostly in their late twenties to the heightened political activism of the year and the emerging environmental and women's liberation movements.